What makes a good sign? Perfect spelling, a clear message, reflective of your business personality, and most importantly it needs to stand the test of time. All products are not created equal and our roading experience means we know which materials work best. One of the first things we ask is “how long does it need to last,” as its all about balancing longevity with price. We don’t recommend using the cheapest product for your building or vehicle as it won’t last long and will cost you more in the long run. We work with our suppliers such as 3M, Ulrich Aluminium and Total Supply to guarantee the quality and durability of our products. Our ISO 9001:2008 quality accreditation means as our customer, you can be reassured our quality and processes are top shelf. Mobile branding is eye catching and it works. Your vehicle is a great way to mobilise your business brand and get it out to a wide audience. Vehicle signage often doesn’t cost much more than a single newspaper ad – but they last a whole lot longer. Be brave and go bold. Or go subtle and professional. We do one off unique vehicles and we love doing fleets where every vehicle is slightly different. 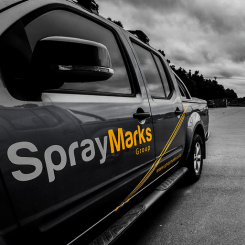 Spray Marks has its own fleet of 80 vehicles and we signwrite them all so we know what we’re doing. For the best results for vehicle wrapping, application should be completed in a temperature controlled, dry environment indoors. Our workshop is huge so we can fit all sorts of vehicles in there. We also have a separate smaller room for cars. Give us a call or come and see us to discuss your vehicle or fleet. We can give you some ideas and put together an obligation free pricing package for your vehicle or fleet which includes design and application. Graphics and branding are powerful tools for promoting your image to your customers. 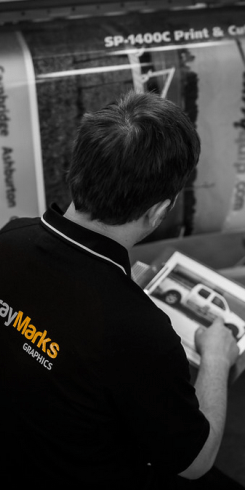 If you’re looking for a new business logo or ideas for your vehicle or building come and see us. We employ qualified graphic designers who listen to what you want and come up with ideas. You may be quite happy with your branding and just need some options on how your logo will fit in that tight spot at the back of your shop. We can help with that too. 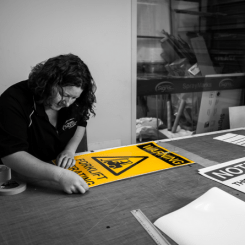 We create thousands of signs each year and we know what works and what doesn’t. We also know the rules about what you’re allowed to do and what kind of permit you may need. You’re in safe hands if you come to us – let us guide you in the right direction. We put signs up rain, hail or shine. And in the wind (which comes in handy around Canterbury)! Indoors or outdoors every sign is unique. With over 20 years experience in signs installation we know the fastest and the best way to get that sign up. And that saves you money. We have our own equipment and plenty of experience installing signs at various heights and on various surfaces. We also work alongside Spray Marks Engineering so if you need a frame custom made we can arrange that for you too. Give us a call and let us help you get noticed!